Adjustable Height Mobile Computer Workstation - Height Adjustable 30" - 37"
This height adjustable computer workstation features a heavy-duty wood laminate surface that provides a stable top for your desktop or laptop. It comes equipped with a pull-out keyboard tray that also accommodates your mouse, and gives you ample room to work with. The bottom shelf is an ideal fit for storing computer equipment. 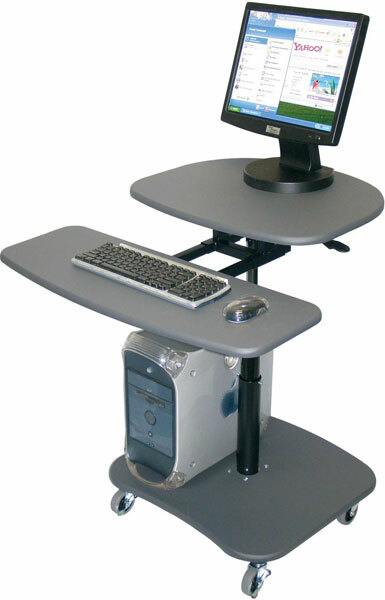 Experience the ease in mobility with moving this workstation from place to place, accommodated by locking 3"casters - 2 with locking brakes. Height Adjustable from 30" - 37"